Hopkins Theatre-in-English Workshop: What are you reading? 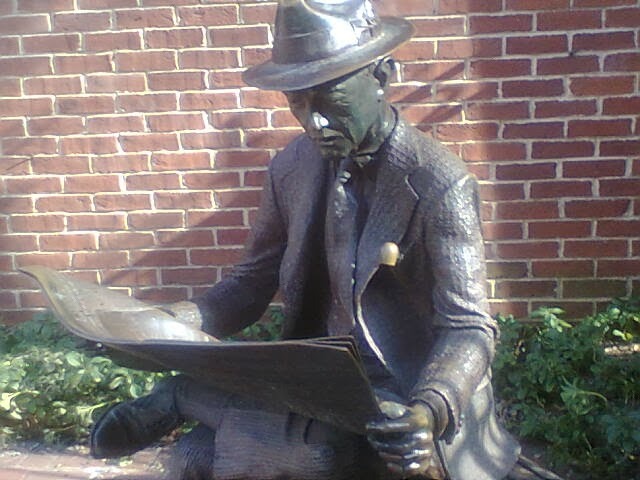 He seems greatly interested in what some reporter wrote in the previous day's paper. Is it true? Why did the newspaper publish it? Did the editor ask the journalist to rewrite the article? Why? Who are the paper's main advertisers? And then what will the reader say to his friends about what he read? Will his version be the same as the reporter's? "Hi!" I said in an imaginary but possible interview. "What's the news?" "Adolf Hitler got married 15 minutes before he killed himself." "Doesn't sound like a very romantic honeymoon!" "No, it wasn't...it wasn't a honeymoon." "I've got your point. But...Did they make love first?" "He ripped off her blouse with the barrel of his pistol." "You know, the one in the holster or...the other one?" "It doesn't really matter much. After you send millions to the gas chambers you loose a certain amount of sensitivity. Still he might have shouted in Eva's ear 'Ich Liebe dich!' while he raped her and she probably reacted by blasting his head off and screaming "Heil Hitler scheisskopf!'" "You have no evidence to back up your story, do you?" "No, not really. But I think the idea would sell." "I thought newspapers were supposed to print the truth." "There's always a theory and a practice." "Yea, but tell me why human beings are so savage?" "Do you think you might find the answer in that newspaper?" "No, but it's a good pastime. We are very special. We can slaughter each other in genocides, torture our 'enemies', insult, rob destroy and devastate everything in sight and we can write the most moving love poems, caress our loved one's cheeks, offer our lives to better those of less fortunate humans...we are unbearable, false, stupid, egotistical and self serving beasts." "Indeed! I think I'll go home and take a hot shower. Could you please lend me the newspaper?"